I was pretty stoked when Red Posie (a vintage & antique store in St. Louis) asked me to try out some Miss Mustard Seed Milk Paint since they’re a new retailer in the area. I’ve been hearing about the paint for months and was über excited to get started! I chose the color Ironstone (white) for my very first project. Now I’ve never used any kind of milk paint before so was pretty nervous considering the paint comes in powder form. 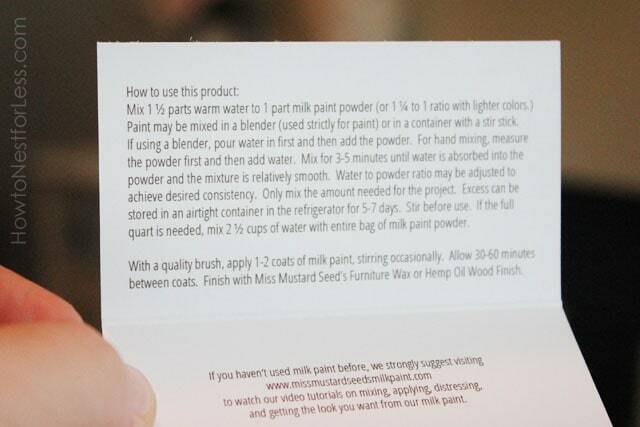 Luckily it comes with easy to follow instructions and you can find video tutorials online at Miss Mustard Seed’s milk paint website. 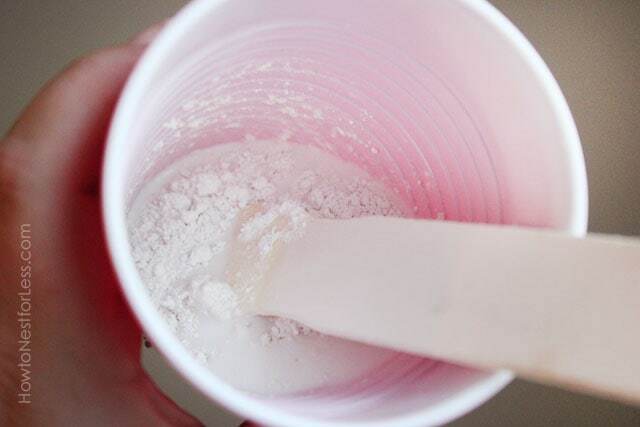 To mix the paint I poured about 1/2 cup of milk paint powder in a plastic cup. I then stirred in 1/2 cup of water (less water since it was a light color and I wanted it more opaque). I mixed it up with a stirrer stick for about 5 minutes and I was ready to get to work. I applied the milk paint with a normal 1.5 inch Purdy angled brush. Once it was dry you could tell it was started to bubble up in some places. I took a metal putty knife and scraped the entire credenza. Wanna see the entire piece? I have to admit I was super nervous about using this paint until the piece was 100% finished. Then I breathed a huge sigh of relief… yep, I’m totally diggin’ it. 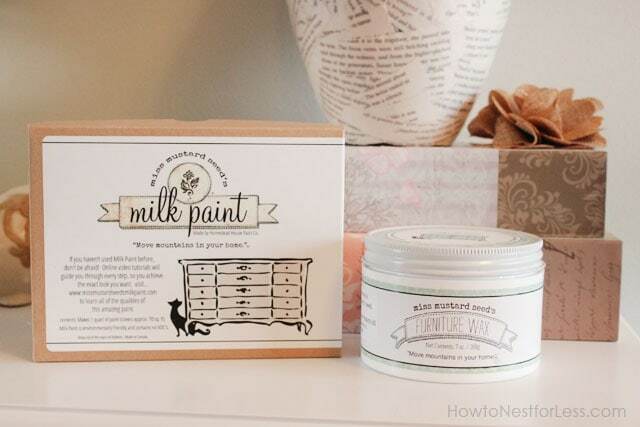 Do you want to try Miss Mustard Seed Milk Paint? I might just be having a GIVEAWAY this week from Red Posie. Stay tuned! Looks great! I’ve not heard much about milk paint. 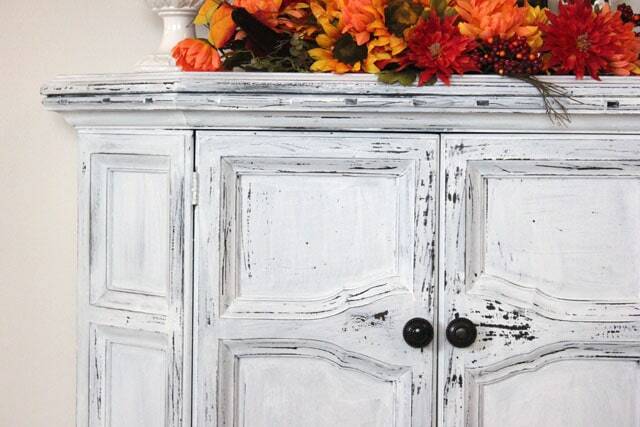 What is the difference between it and chalk paint for furniture? I just used ASCP for the first time and I loved it! Thanks April! 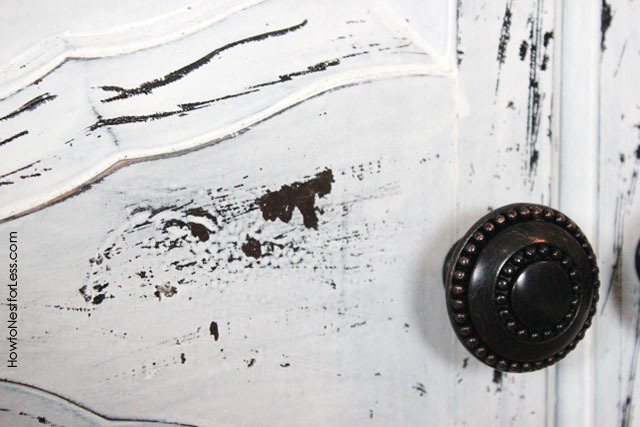 Milk paint will actually chip and peel away in certain spots (but not on all furniture so it’s kinda a gamble!). No need to prime beforehand just like ASCP. The biggest draw for me was the chipping & peeling of the paint. I love that look! Hi April, milk paint will give your painted furniture a convincing aged look that no other paint product I have found able to do. Thanks so much Desiree. Have a great week! Love it Erin! I’ll have to get some and give it a try! oooh, field trip to Old St. Charles! 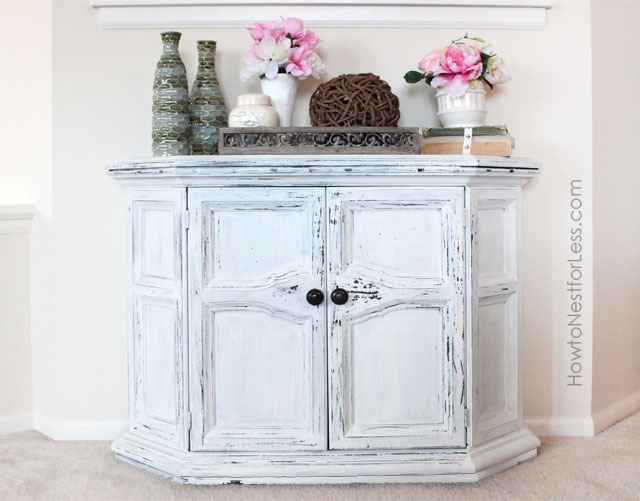 Beautiful, i have a dresser i would love to try! I just did…i am not sure i enter correctly though! Fingers crossed! I love it! I’m sure it looks great with your other recent projects! It looks like it turned out pretty well! I like the weathered spots. I feel like I need to tackle ASCP before moving on to milk paint. Baby steps. Yeah, I was freaking out the entire time I was painting since I’m so used to ASCP, but it did turn out ok… whew! This looks awesome, I love all of the chipiness and color!! It looks great Erin. Can you confirm that this was one coat? 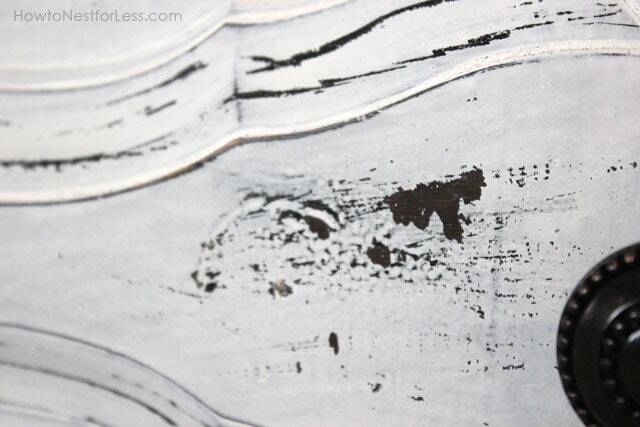 If you are going to use two coats do you just leave the crackled areas as is and scrape after the second coat dries? Oops, sorry about that! 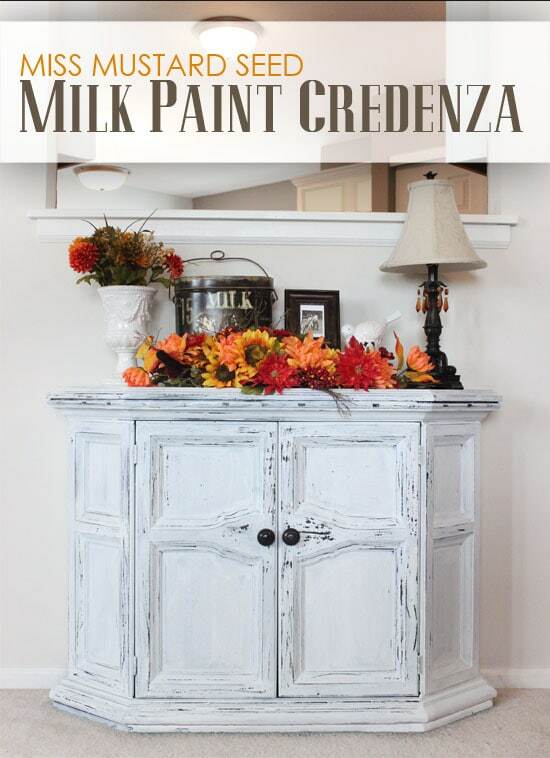 I used two coats of milk paint, but I have so say that this stuff goes a LONG way! After the first coat it crackled a bit but I didn’t scrape until after the second coat. Hope that helps! Gorgeous! Thanks for the tip about Red Posie! I’m in the STL area and hadn’t heard of them, so I’m excited to check them out! THanks Ami! Definitely head over to the shop. There’s some amazing finds in that space! Oh my goodness….it looks super amazing! 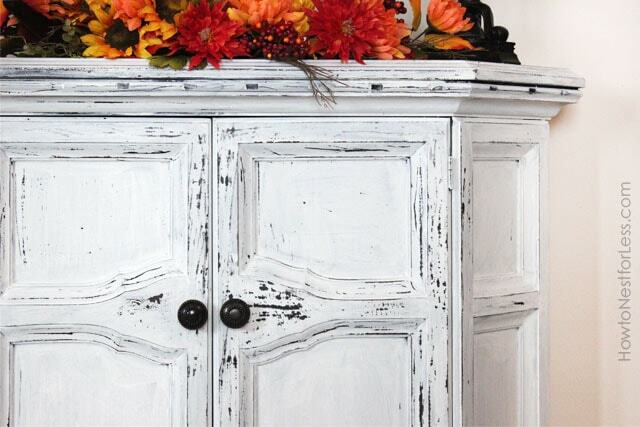 I use chalk paint but have been a little aprehensive to try the milk paint….going to order now. Love your site…will be following. Thanks for the inspiration. This is beautiful. You did such a good job. The finished piece is amazing. I agree with everyone it is gorgeous. And what a great piece to have in your home to decorate with. It is great! This project is just lovely. 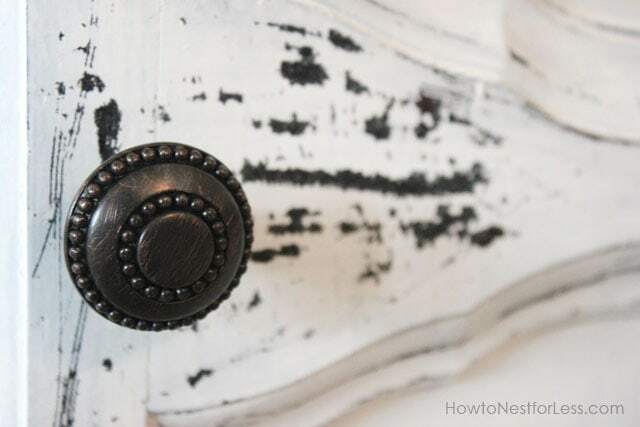 I love how the milk paint looks–now I want to try it more than ever!